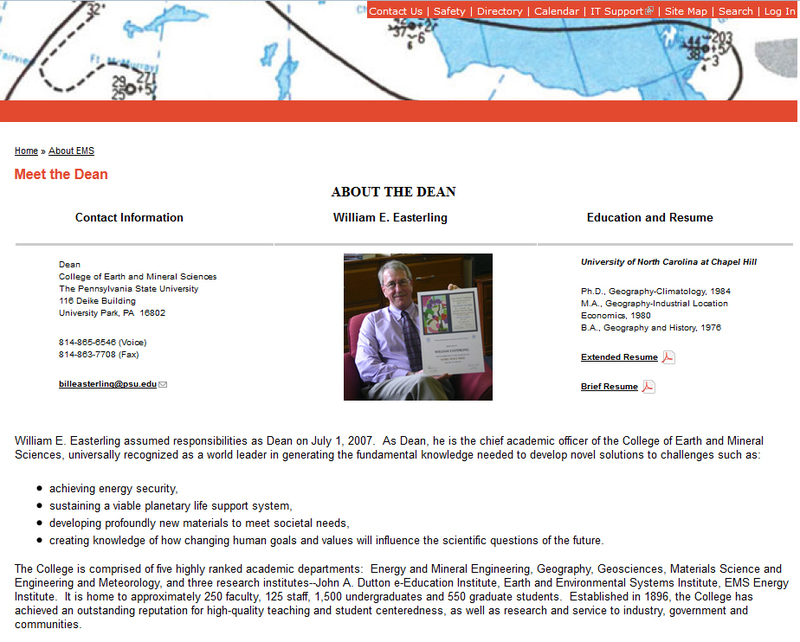 Michael Mann’s boss at Penn State University – Dean William Easterling – falsely claims to be a Nobel laureate on his CV. I’m launching a new blog today. It’s called the Fake Nobel Laureates Hall of Shame. Its purpose is to shine a big, brash spotlight on the numerous individuals who continue to improperly claim that they are Nobel laureates and Peace Prize winners as a result of their association with the Intergovernmental Panel on Climate Change (IPCC). The blog will also call attention to the media outlets that, a full year after the IPCC issued a formal statement declaring it “incorrect to refer to any IPCC official, or scientist who worked on IPCC reports, as a Nobel laureate or Nobel Prize winner,” continue to describe IPCC-linked personnel in this manner. I expect the membership of the Hall of Shame to swell in coming weeks as, with the assistance of readers, additional instances of this particular brand of exaggeration, hyperbole, and self-aggrandizement come to light. The blog includes a photo gallery as well as a master list of those being named and shamed. Over time, I hope to develop full-fledged profiles of each individual. The person in the spotlight today is William Easterling. He’s a Dean at Pennsylvania State University – and climatologist Michael Mann’s boss. When outsiders tried to double-check the math behind his “hockey stick” graph, he refused to share all of the necessary information. In a 2005 letter addressed to a subcommittee of the US Congress, Mann said his computer code “is a private piece of intellectual property.” He then cited a disgraceful letter from David Verardo of the National Science Foundation, that referenced the opinion of the Foundation’s legal department. Michael Mann and the National Science Foundation are hiding behind lawyers. According to climate change activists it’s only the future of the planet that is at stake. But rather than share his computer code so that his calculations might be verified, Mann chose to lawyer-up. Yeah, that’s how a real scientist behaves. I’m sure Einstein did that all the time. A year ago, Mann launched a defamation lawsuit against two journalists. The legal papers associated with that lawsuit falsely claim that Mann was “awarded the Nobel Peace Prize.” They further suggest that defaming a “Nobel prize recipient” is worse than defaming an ordinary person (see paragraphs 2 and 5). Has Mann been shunned by his scientific peers? Are his colleagues at Penn State ashamed of his behaviour? Are they worried that he is bringing their department and profession into disrepute? On the contrary. In January of this year, Penn State conferred on Mann a new honour – that of “distinguished professorship in Penn State’s College of Earth and Mineral Sciences.” The person who gave him this exalted title was none other than Dean William Easterling. 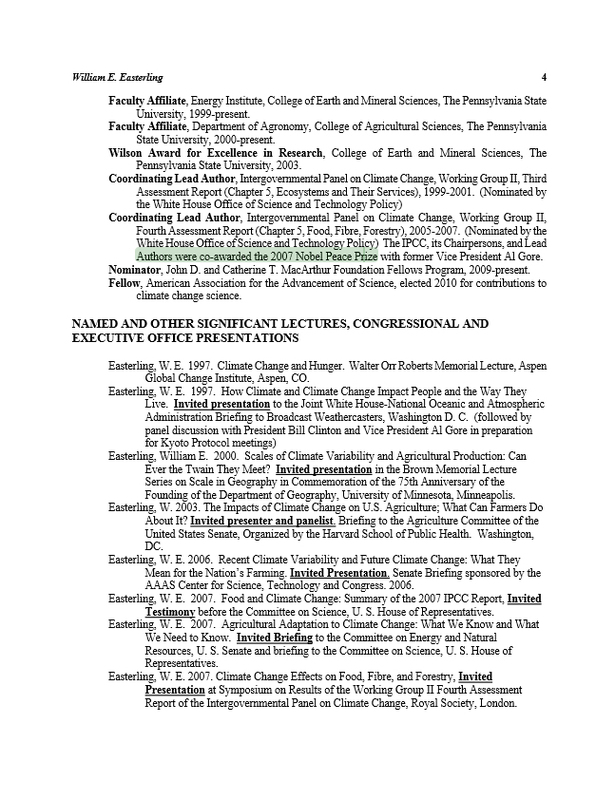 His academic bio page includes a photograph of him holding his IPCC-manufactured certificate – the top half of which is a reproduction of the diploma the IPCC received from the Nobel committee after it was awarded half of the 2007 Nobel Peace Prize (Al Gore won the other half). I think it’s outrageous that a Dean is confused about whether or not he, personally, is a Nobel laureate. This isn’t the sort of leadership one expects from someone so senior. How do the individuals who comprise Penn State’s Board of Trustees defend this? In any case, come on over to FakeNobelLaureates.com and take a look around. Steve McIntyre wrote about Easterling back in 2011. The post-Climategate Penn State investigation that cleared Mann of wrongdoing has always smelled. This entry was posted on October 16, 2013 by Donna Laframboise in ethical & philosophical, IPCC and tagged Intergovernmental Panel on Climate Change, IPCC, Michael Mann, Nobel Peace Prize, William Easterling.